Ms. Vidhi Jain (ID No.2014A7PS113) was declared as the Winner of the 'Citi Women Leader Award 2016-17' on 7th March, 2017 at Citi Group's First International Financial Center in BKC, Mumbai. 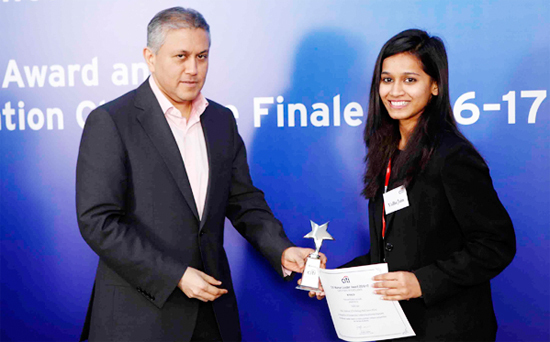 Citi India shall provide her scholarship to support one year of her study at BITS Pilani. The competition was to assess and identify leadership potential among women across eighteen top campus winners in India, which included top B-schools and five technical universities - IIT M, IIT B, IIT D, IIT KGP apart from BITS Pilani. BITS Pilani is a renowned institute offering higher education in the fields of science, engineering, pharmacy and management. A deemed university since 1964, BITS Pilani has a history spanning more than a century.